It is helpful to learn how to approach a frightening situation with a controlled calmness. Having “been there” prior to the actual encounter is a great way to condition your body and mind, even if you have only “been there” in training. Learning the martial arts can take a lifetime of work. 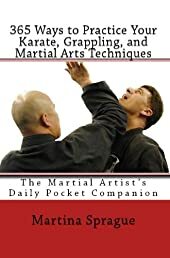 To make your journey more manageable, this book will introduce you to 365 ways to practice your martial arts techniques, extract information, and analyze the concepts you have learned in class, so that you can gain the skills you need to approach your technique training with confidence and maximum intensity. Study one suggestion each day of the year, and you will soon have broadened your views beyond the basic instruction you receive in the training hall. Martina Sprague is a military historian and martial artist. She has studied the martial arts since 1987 and holds black belts in Kenpo karate, kickboxing, and street freestyle. She is the author of several martial arts and military history books. For more information, please visit her Web site: www.modernfighter.com.